And now we have a bridge! By the way, modelling that bridge got me thinking that this was probably one of the most idiotic bridges ever conceived. A bridge at a 45 degrees angle, really Quite a way to make a restricted access to the reactor! It's okay, it was designed to break anyway. A bridge at a 45 degrees angle, really Quite a way to make a restricted access to the reactor! 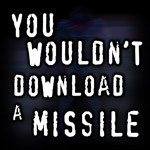 That's why Shin-Ra sent 1st class Soldier agents there. bridge was built, then returned to its place of rest to dream with giving some love to Lavos (from Chrono Trigger). BTW, you are doing some beautiful work with that scene. Bridge is textured. 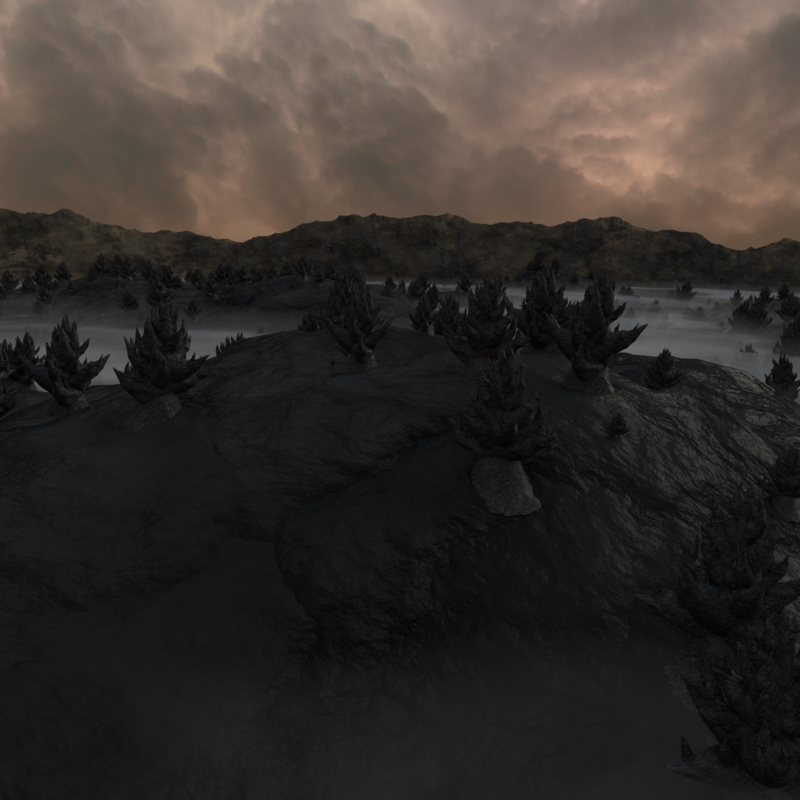 I also worked on some atmospheric effects with low-altitude mist and clouds. It may look slightly odd because the mountain scape doesn't extend as far as the clouds do (which will be remedied, of course). 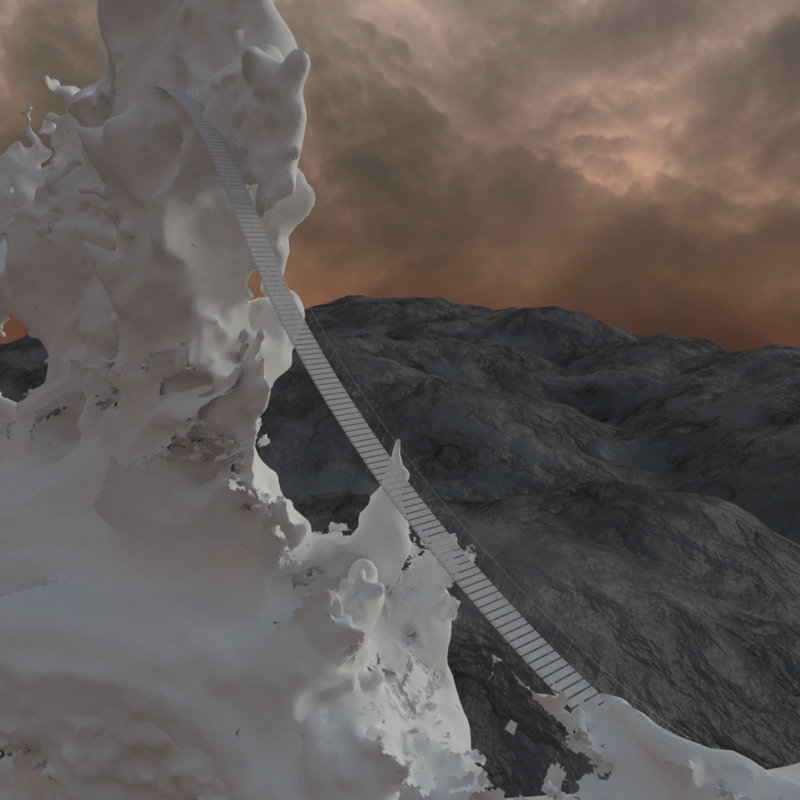 What I'm quite happy about is that I managed to make the clouds and the mist without using any scattering shader, while scattering shaders are usually quite demanding in terms of computing power (and render times). In other words, the method I used (clouds are made with a plane with a properly crafted texture, the mist is made by a combination of Z-depth and height pass in the compositor) is rather quick to render. Awesome effort! Well done Mayo! Looks nice without the materials, bit like an iceberg, I'm glad you made progress. 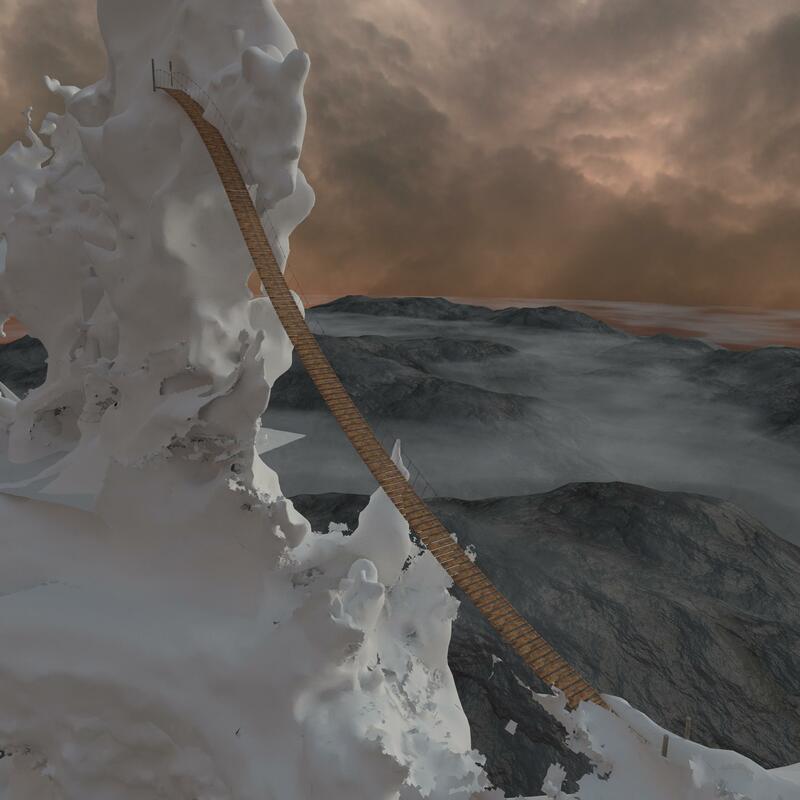 Spent some time on the modelling and texturing of the mountain range which will make the horizon line... Maybe it will need some color/brightness adjustments, but I think I have a good base for it. Don't eat yellow snow... even if it might be beer! In more details: The model is based on a giant subdivided annulus, where the central circle of the annulus was given more elevation. Add to this more subsurf levels and 2 displacement modifiers using procedural textures. For the texturing: the trick is that I wouldn't use UV mapping here, because of the insane size (the annulus being about 50 km in diameter!) of the object. So textures are a combination of procedurals with texture images, where images had to be mapped along a spherical mapping scheme. Unfortunately, the spherical mapping scheme isn't available by default in the Cycles render, but fortunately, it can be recreated (thankfully someone made it before because it's not obvious!). Now the other trick is that I found a good way to make texture functions depending on the slope of the mountain (as you can see, the cliff-like texture shows only on the near vertical areas of the mountain), using the scalar product of the surface normals with a vector along Z (which is pretty neat). - Reboot my background texture for the clouds, because at the moment it doesn't follow how perspective should stretch the clouds towards the horizon. That's all I can think of for now, but if you have other ideas it will be good for me to have that input. Note that I'll be away for the next two weeks. What does the background look like in relation to the scene? Or in other words, what does the scene look like as a whole? I know you have mentioned the shape of the geological formations, but also consider the size. They may not be, but to my eyes they all look a similar size. One of the tricks of the shapes is to have them non symetric instanciate and rotate them randomly. That would give a more natural look. they all point up! that's what was bothering me about it!